Before I start my story, I need to tell you what happened in Center City. You see, there was this man named Dave Stafford. And there was this man named Sam Britton. Well, Sam Britton was the big king pin in Center city. Sam Britton was a con artist. They met one day at Britton’s house to discuss some…er…business that would occur in North Fork. You know what that means! Trouble for me and Mark, as usual. Well, North Fork and Center City were both trying to get the railroad spur. Well, Dave was being paid to make sure the spur went to Center City. There was only one way he could make sure that happened – by coming into North Fork and becoming our really good friend so he could be elected to be our representative. Okay, now here’s our story. It started one morning as Mark and I came outside early one morning to great a new spring day. The snow was finally gone for the winter, and the wind was favoring. Mark stuck his finger up in the air like he had seen me do so many times before. “Due East,” he stated. "Spring rains coming on," said Mark with some uncertainty. He was right. I could tell there was a new storm brewing and it was coming our way! "You sure know a lot about a lot of things," Mark commented proudly. He had and idolizing smile on his face. "You will too son when you get to be an old man like me,” I commented. Mark thought that was funny. While we were talking, Dave Stafford rode in. I asked him if he had purchased himself a ranch yet. “I haven’t found the right parcel yet,” he answered. “You know, when your planning on settling in a town, buying yourself a spread’s a pretty important decision to make!” Dave commented. I laughed. I couldn’t argue with him there! I couldn’t help to compliment Dave on how easily he’s managed to make lots of friends in North Fork. I told Dave that the people around here don't usually warm up to strangers, but they sure have takin' a likin' to him. "I like people, people like me. It's uh…sorta catchin', I guess," said Dave. “You know, Lucas, I’ve got a lot of faith in this town. And that railroad spur should really boom our cattle shipments. I wished I had as much confidence that we’d get the spur. Mark proudly stated that when I got to Yuma, I’d convince the railroad committee that we should get the spur. I sternly reminded Mark that I hadn’t been elected yet. “Now hold on, Mark. The council won’t decide that until tomorrow. Anyway, I think Dave here is the best choice. He already knows some of those railroad people. Dave was trying to be modest. He said they if they did send him he would like the benefit of my thoughts on this. "We’re all interested in what's best for North Fork," stated Dave. Mark busted in then. "You bet Mr. Stafford! Best for North Fork and the worst for Center City," he exclaimed. Dave and I cracked up laughing! Mark looked at us and smiled, proud that he had made us both laugh. Well, Mark got his wish! I was elected to the North Fork’s representative. John announced, "After due consideration, we decided that our interest could be best served by a man who has already got his stake planted here in North Fork - Lucas McCain!" That announcement was certainly good news to my son! "You're going to Yuma Pa!" he proudly stated, grinning from ear to ear. The town folks all started laughing. Everyone congratulated me, including John and Dave. John turned to Dave before we left and explained to him that he was their second choice and they had weighed his previous dealings with the railroad people, but was sorry they hadn't know him longer. Dave said that he did understand. I also told Dave I was sorry. We shook hands and Dave said that I had nothing to be sorry about, that I should be glad that the town had so much faith in me. Just then Toomey came up to me and said, "We're all with you Lucas," and handed me the surveys that I would need when I presented our case in Yuma and told me to take good care of them. I sat down on the bench and started to glance through the surveys. "Pa, when we get that railroad spur here in North Fork, that'll mean you'll ship your cattle by train won't it?" I told him it would and asked him why he asked. "Then I can go with ya! I haven't been on a train since I was a kid." Just then, Micah offered to buy me a cup of coffee to celebrate. I said yes, then I looked at Mark, waiting for one of them to say something. It didn’t take long! “And some sarsaparilla for Mark,” Micah stated. "Oh boy!" exclaimed Mark as he ran out the door ahead of us. John was surprised that someone left $500 to someone in North Fork. Naturally he was very curious as to who the lucky person was. Then he named the person. It was me. Needless to say, both John and Micah were surprised. In fact, Micah had so much trouble believing it that he grabbed the paper out of Trimble’s hand and looked it over. 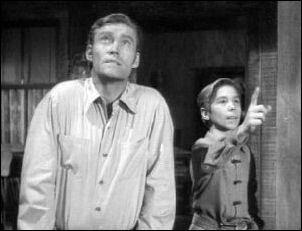 But he assured Micah and John that it was bona fide through and through. The waiter, was pouring Micah's and John's coffee at the time and overheard every word that was said. While Micah and John checked over the document, the waiter went out to spread the news to the card players in the other room. The men had as much trouble believing this news as Micah and John did. As these words sunk in, Toomey began to realize that the news may hinder me from getting the railroad spur. Toomey was no longer in the mood to play cards. He didn’t think I was the right person to send anymore, and he was going to let Micah and John know it. Dave only smiled a knowing smile. “Seems so,” he answered with a victorious smile on his face. “Well sure, pa but-“ Mark started. Mark was confused. “Well then why’d he leave you all his money?” he asked. “That’s what we’re in town for. To find out,” I answered him. I had to nip that in the bud right now! "Mark, money is nothing but paper and green ink. The thing gives it value is how it's earned. An outlaw's money is never earned. It’s not the kind we want." Mark wasn’t sure he agreed with that. I could tell by looking in his eyes, but he knew better then to argue with me. I jumped off the wagon and started for the bank. “Want me to go get Micah?” Mark asked. I thought that would be a good idea. I watched him leave as I tried to figure him out. The truth was, sometimes I couldn’t! As I was walking to the bank, two men were drinking outside. One of them tossed me a bottle. I guess word had gotten out that an outlaw was leaving me $500. I refused the bottle and tried to hand it back, but they were giving me a hard time. So I simply threw it down. That made them mad. The first man tried to punch me, but I punched him instead. Then the second man picked up part of the broken bottle and came at me, but I moved and he jammed his hand into the wall of the saloon, cutting his hand. This made him even madder. They were both coming at me. Thankful, Dave came to my aid and helped me punch out these two men. I was relieved he had been there! Mark ran over to make sure I was okay while Micah chased the two drunks away. Suddenly we heard thunder. “Looks like your storm’s coming on, pa,” Mark commented. I thought it looked like a big one. If only I knew the storm that was brewing up for me! On our way to the bank, Micah questioned me about Wade Joyner. I told him the same thing I had told Mark – that I didn’t know him. I was getting pretty upset that everyone keeps telling me I must have known Wade Joyner. I didn’t agree with them! Remember the storm I saw was brewing up? Well, I walked in on it at the bank. I came in and asked John what was going on. Toomey had been there talking to John when I walked in and jumped up upon my arrival. “Well, we were hoping you could tell us!” John answered. Suddenly, a man, whom I would soon find out was named Mr. Trimble, walked up to me. “I’m giving you due and legal notice of your inheritance. You may read all about it in this copy. That finishes my business. Good day, gentlemen.” I’m not sure why he was so set on leaving so quickly, but I stopped him before he could get out the door. “I don’t know any Wade Joyner,” I argued. “Neither did I, Mr. McCain. I just happened to be unlucky enough to be there when he died,” he explained to me. Instead of answering my suggestion, he turned to my son. "Is your name Mark?" Mark nodded. "It's all there Mr. McCain. Joyner mentioned you had a boy, Mark. There's no mistake!" He said he would see that the money was sent to me and then he headed on his way. Toomey’s short speech left me wondering. But I wanted to get the words right out of his mouth before jumping to any conclusion. “What are you trying to say, Toomey?” I asked. That made me angry. “You mean because a man I don’t know left me some money I don’t want and suddenly I’m a different person?” I flared. Dave butted in then and told me they were thinking with their pocketbooks. 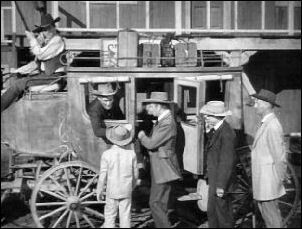 “These railroad men will thing you rode with Wade Joyner!” Toomey suddenly shouted out. I couldn’t believe this! “Rode with Wade Joyner? I never laid eyes on him!” I loudly argued. Toomey then proceeded to tell me it was business – not personal. Well, Dave was happy. He got to be North Fork’s new representative. He tried to play it up really good by acting like he didn’t feel right to take my place. After the men walked out, though, he smiled a smile of victory. The storm came all right! It was quite a storm. It had washed out the road home so we had to stay at the hotel. I had a small battle in getting Mark to bed, but I won that battle. After I had him tucked in, he got to thinking. “You know Wade Joyner said he knew me, but I don’t remember him,” he commented. “Well, you were never too little to remember!” he commented. I couldn’t argue with him there. I decided I was fighting the thing too hard. Then I got to thinking. “Could have been a long time ago. Could have been using another name…fella comes in says his name is Smith…maybe Brown…” I thought. I turned to ask Mark a question but found he was fast asleep. I smiled lovingly and walked over to his bed as I tucked the covers up over him. As I was doing so, there was a knock at the door. It was Dave. He wanted to talk to me. “You know, fate has a way of stepping in and changing things,” he stated. “But it shouldn’t change friendship,” he stated. "I didn't ask to go to Yuma, but I can hardly back out now. I’d hope that North Fork would have been 100% behind me on this. And you’re an important part of North Fork." I assured him that he had my support. Then he asked for the survey maps. I told him they were at the ranch and he could get them anytime. Suddenly, a loud clap of thunder sounded again. Dave commented that it had been a few years since he had seen a rain like this. That got me to thinking of an experience I had through a storm like this. “I used to live near Desert Flats. We’d wait three years for a rain like this. I remember once after my wife died. Biggest rain you ever saw! Mark had a cold. It wasn’t much, but you know how it is…me being alone with the boy for the first time. I was worried.” Dave commented it was tough being alone at a time like that. “Well, I wasn’t really. A fella came along. Half drowned, needing a night’s rest. But he didn’t get much. I’m not a talking man, Dave. But that night sitting up with Mark, I really bent his ear – like I’m bending yours right now. I told that stranger almost everything about us. Sometimes I had plans of settling down in these parts, the kind of ranch I wanted, my hopes for the boy, and how a good part of a man's dreams depends on hard cash. Suddenly, the realization hit me like a ton of bricks! "Hard cash!" Without even trying, I think I had figured out the truth. “He talked about how he never had any dreams of his own beyond tomorrow, how he liked to listen to mine.” I was thinking to myself out loud more then to Dave. Dave didn’t understand what I was getting out. Suddenly Mark moaned as another clap of thunder sounded. I hurried over to the bed. “It’s an awful storm,” he moaned. The next morning was clear. The storm was over. Micah was really bothered by the fact that I was being treated by an outcast. 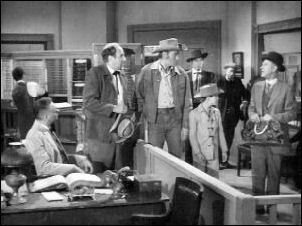 Dave walked into the bank as Micah was stating to John, “You know something John, if Lucas could back up that story of his with some truth, I still feel the right thing to do is to send him to Yuma.” Dave had come into the bank to discuss the final details before leaving. 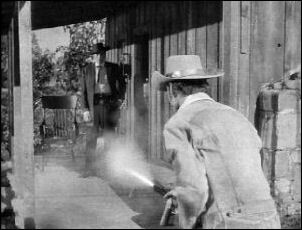 Micah wanted him to know that what he had said was nothing personal against him. Suddenly, Sam Britton walked in and introduced himself. He and Dave really played up the scene – Sam acting shocked that I was no longer going, and Dave covering for the town’s decision of sending me! Later that morning he came out to the ranch to get the survey maps. He suddenly commented to me about meeting Sam Britton in town and told me he had his hooks out for me and was waiting to get at me. He wouldn’t have spared those railroad people any details. “No. You’d have been inviting two battles in Yuma, Lucas.” This whole matter still bothered me, but I supported Dave. After all, it wasn’t his fault this all happened – at least, I didn’t think so at the time. Suddenly, I heard a horse approaching my horse. I got up to go see who it was and was surprised to see my son coming. After all, he was supposed to be in school! He rode up right next to the door. I put a hand on my hip and looked sternly at him. “It’s just noon. You’re supposed to be in school!” I stated. “Yeah? So you’re playing hooky?” I asked as I opened it. “Why, I’ve never seen $500 before!” Mark tried to explain. But he begged. In order to get him off back to school, I agreed to one quick look. I took the money out and flashed it in front of him. “Wow!” he shouted. “Now you’ve had your look,” I stated and motioned for him to get going. With no further argument, he left. The words in the letter made me very happy. I hurried back inside to tell Dave about my discovery. We only met that one night in the storm. But I never met anyone before or since that made more sense. Here’s some cash for your dream. “A lot of people will be surprised when they read this,” I stated as I stuffed the letter back into the envelope. I better tell Micah and Hamilton and the rest of the council. And wait until I see that Mr. Britton you mentioned,” I stated as I got ready to ride into town. I sensed that something was wrong, but I didn’t want to let on anything yet. I just commented to him that he seemed really anxious. He tried to cover up his words by stating that he wondered what would be best for North Fork. "Let's let North Fork decide that,” I stated. Suddenly, my instincts kicked in, and I knew this man wasn’t the man he had claimed to be. I slowly put my hat on. I paused at the door mentally sizing up the situation in my head. Then I reached for my rifle hoping I wouldn’t have to use it. I walked out the door, keeping my senses trained on the man that was going to follow me out. Well, he didn’t disappoint me. As soon as he walked out the door, he put his hand on his bun and started to lift it out. “I wouldn’t do that if I were you, Dave!” I said. Then I turned around. “I got enough fire power here to cut you in half!” Then just in case he didn’t believe me, I demonstrated my shooting ability by shooting the a shot on every rung of the chair on my porch. I was anxious to know who had been making it worth his while. “The railroad spur means a lot of money to a man like Britton,” he stated. I had to tell him that if he was going to kill me, he should have done so when I read him that letter. He didn’t understand that I had good senses, and the smallest thing would throw suspicion. Dave smiled as he handed me his gun. “That’s my weakness, Lucas. I’m better at using conversation as a weapon then a gun. I left the next day for the meeting. Mr. Briton was getting ready to get on the stage when I suddenly poked my head out and introduced myself. "McCain's the name! Step right in Mr. Britton!" It was obvious this wasn’t a pleasant surprise for him. "Are you going to Yuma Mr. McCain?" "That's just where I'm going Mr. Britton." John Hamilton told him that Dave couldn't make it that he had a previous engagement. Mr. Britton assured John and Micah that Dave's activities were of no interest to him. Of course, none of us believed it! Mark ran up to the stage to say good-bye to me. Of course I would miss my boy! I reminded to be good and do what Micah told him to do. I was going to enjoy my trip just fine, I thought! I couldn’t wait to get my paws into Mr. Britton! piddlin stuff.....William Bishop played Dave Stafford. He's the guy who was to representative North Fork at the railroad commission. 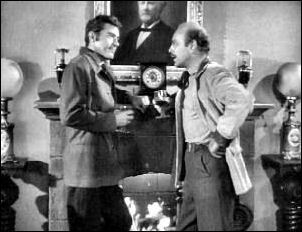 Dabbs Greer is one of your most well known character actors. He has been in the business for over five decades. He has appeared in The Rifleman eight times ― Outlaw's Inheritance as Marcus Trimble, the lawyer from Santa Fe ― Boomerang as Sam Elder, the elderly gentleman who was about to loose his ranch ― Panic as Brett, the towns trouble maker ― The Jailbird as Farley Weaver, the man just released from prison ― The Promoter as Jack Scully, the man who was taking bets on Reuben Miles ― The Wyoming Story (1 & 2) as Finny and The Stand-In as Taylor, one of the prison guards. Bartlett Robinson played Samuel Britton, the guy who hired Stafford to make sure Lucas didn't get to go to Yuma to represent North Fork. Robert Foulk appeared in five episodes, four times as Toomey ― The Raid as Toomey, the man who wanted to turned back, he didn't want go on to help Lucas find Mark ― The Second Witness as the Toomey, the man who made the coffin for the witness ― Three Legged Terror as Toomey, the man who Johnny Clover was sketching when his uncle came to Lucas' ranch ― Outlaw's Inheritance as Toomey, the man who didn't want Lucas to represent North Fork after finding out out Lucas' inheritance ― The Lost Treasure of Canyon Town as Herbert Newman, the man who was trying to hide the secret of the lost treasure. *According to the credits in The Three Legged Terror — Toomey is also a Blacksmith — See Arnold Laven's comments on this in The Producer's Corner. Harlan Warde appeared in eighteen episodes as John Maysfield Hamilton, President of the North Fork Bank. He was first introduced in The Safe Guard. In this episode North Fork's Bank was first established and John Hamilton was new to North Fork. 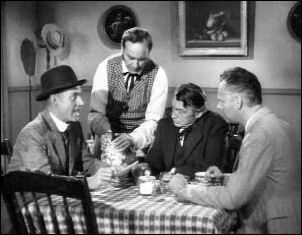 Fred Graham as Hank the Drunk. George DeNormand as one of the townsmen in The Photographer ― Outlaw's Inheritance.